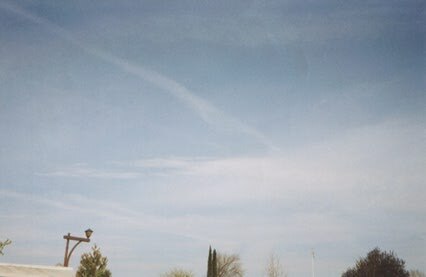 Note - For those of you who are "sitting on the fence" in regards to the "Chemtrail/Contrail debate" I think it's important to point out that "jet exhaust emissions "alone," regardless of whether or not "anything else" is being added are "toxic" and calling the "plume" left in a jet's wake a "chemtrail" is a far more accurate picture then labeling it a "harmless condensation trail, i.e., contrail." Moreover, anyone who has felt the sun's rays while passing in and out of a cloud can testify to the significant temperature change that is experienced from such an event. 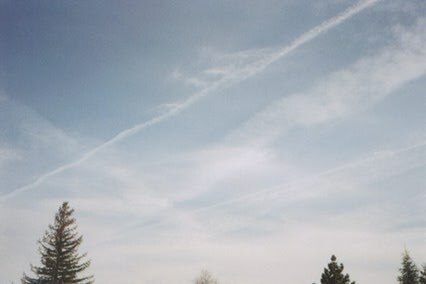 The following pictures of "chemtrails," were taken on May 11th, of this year in Sacramento,California. That morning, prior to the over flights, it was "crystal clear." As the plumes expanded, and joined with other plumes, in a matter of hours the entire sky was overcast. This obviously had an effect on the temperature as it was predicted to be "clear and sunny." Forgetting the rather strong arguments of "other additives" in the emissions of a jet's exhaust, there is no debate that said exhaust is harmful to humans, and "can" affect the weather. To this end, "we all need to be concerned" in regards to what we and our environment is being subjected to via "jet emissions." 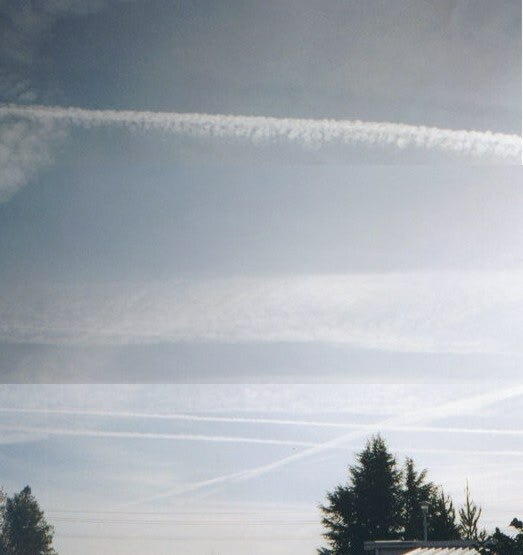 This single photograph, is the result of two photographs taken in sequence and then "stitched together" in order to give a better perspective of the event. This shot was taken at the same time in a different direction. Another in a different direction. *One last item of interest, these trails appeared to be at a "lower altitude" then "normal air traffic" of the area.